Distance from San José: 335 kilometers. Dry Seaon: January through March. 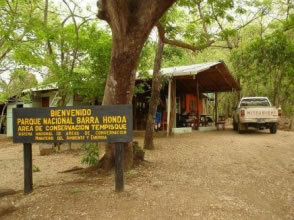 Barra Honda National Park was created in 1971 to protect its famous cave systems. Although most of the park has been cut over in the past, wildlife is fairly abundant and increasing with protection. A good trail system takes the visitors to the caves, where unusual limestone formations offer spectacular views. The park is located east of the town of Nicoya, on the northern part of the Nicoya Penincula. 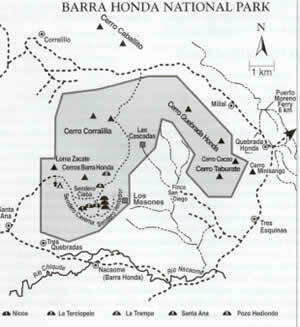 Barra Honda Peak has a vast system of independent caves, nearly 42, of which only 19 have been explored. 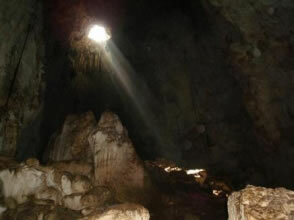 This caverns are renowned for their pristine condition and conservation efforts have helped to retain all the geo-biological features of the area. 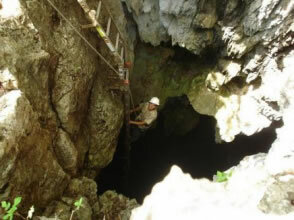 Vertical entrances to the caves require special equipment and trained professionals. The place is home to many rare and threatened species, including curassows, crested guan, brocket deer and jaguarundi, along with some more common species like howler monkeys, raccoons and kinkajous. There are excellent tide pools along the coast, and Isla Cabo Blanco is a very important seabird-breeding site.